The Lady Rams of North Thurston High School defeated Capital High Schol 3-2 Thursday, March 21, 2019 in SSC league play in west Olympia. North Thurston (2-0 SSC, 3-1) currently leads the league after wins over Capital and Yelm. Capital (0-2 SSC, 1-2) will regroup as they host Centralia in non-league play Monday. North Thurston brings a strong senior-rich team into 2019 play, led by Brooklyn Harn and Amanda Campbell, senior co-captions. Harn and Campbell have played together in doubles play but didn’t pair together in the match. Harn defeated Capital’s Stephanie Nguen 6-0, 6-0 in the varsity singles #1 paring. 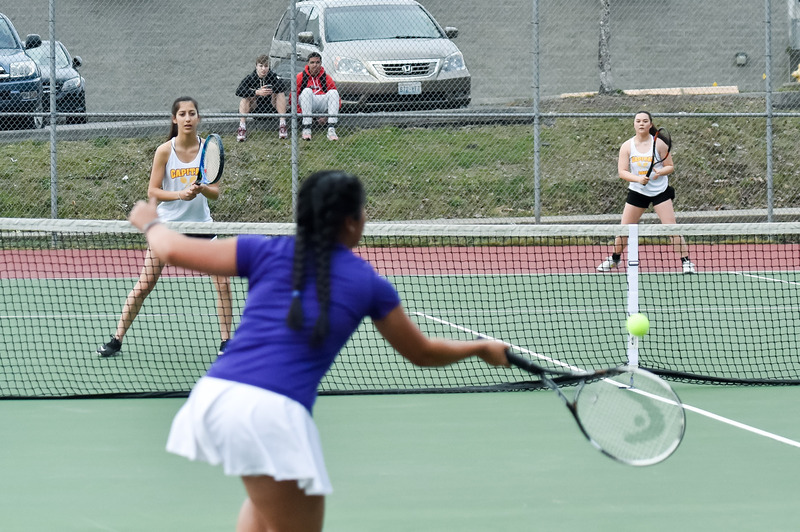 Michelle Hyland defeated Tionna Tolefree in singles #2 play to sweep the singles games for North Thurston. Capital won the doubles #1 and #2 games, but fell in the doubles #3 game to win the best of five team match for North Thurston. Capital’s Anna Hagen and Morgan Penny battled Peyton Hayes and Amanda Campbell in the closest game of the day for a 6-7, 6-3, 6-3 victory for the #1 doubles team from Capital.